My grandparents had 6 children. My Grandfather knew and got by in three languages without having studied the foreign languages at school. He just picked them up from newspapers and people around. Due to the political situation these languages that life presented to him were Estonian, Russian and German. A sentence spoken at the wrong time or in the presence of wrong audience brought him to prison and eventually my Grandfather was lost in the devastating hurricane of the war. I admire my Grandmother for bringing up her six children alone. These were not easy times. No matter the hardship of the time or the (un)availability or (un)affordability of food, children always want something sweet. 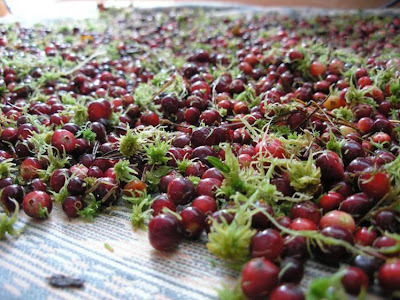 Here is how the cranberries come to play and why I would like to pay homage to this red berry from the moorlands. Firstly, picking them from the nature was and still is free. Secondly, they are easy to preserve. Since sugar was less available in the first half of the last century it was not always possible to preserve berries and fresh fruit in jams and marmelades as these required a lot of sugar. There weren´t any freezers around like now to store fresh berries for months. 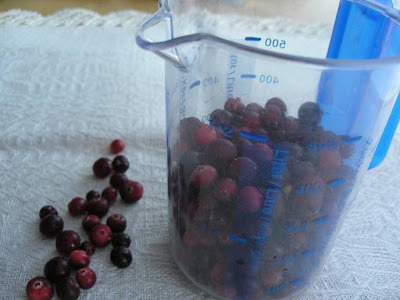 Cranberries are easy to preserve in glass jars (3 liter, 5 liter or even 10 liter jars) in water in a cellar. Thirdly, cranberries are full of vitamin C and massive other useful elements. Fourthly, most importantly, cranberries make an excellent dessert that is very popular in Estonia. 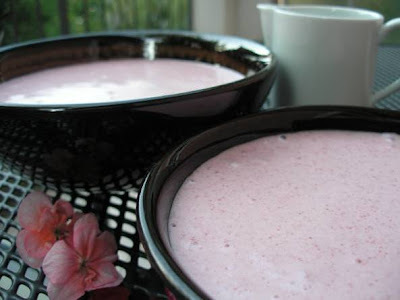 It has many names: "jõhvikavaht" (literally cranberry foam), "mannavaht" (semolina foam), "roosamanna" (pink semolina), "roosapuder" (pink porridge), got to be more... Given that the Estonian language is not extensively rich in synonyms (unlike the English language for example) the fact that this dessert has more than one or even two names speaks for itself. To add to its popularity I have to mention a tool that existed in the old days and was used to make this dessert and maybe also to beat eggs or something else. It was called "püürüs" in the South Estonian dialect. "Püürüs" is a stick with three or four "branches" at the bottom, made of wood, suitably from a branch of a tree. Yes, a whisk, as it would be known now. The one that my other Grandmother who lived in the countryside had and made the cranberry foam for my father and his two siblings still exists in the "family museum". So this dessert was one that was inexpensive, could be made fresh also in winter when no cranberries were available from the nature, and did not require a lot of sugar, but still provided the much desired sweet joy and happiness to the post war children. This dessert has stood the test of times and has not gone out of fashion. It is well loved by Estonian children and grownups. The real foodies and fans of fresh home cooking still go and pick the cranberries themselves in the moor in autumn. The easy alternative is to buy the cranberries on the market or in winter in the frozen form. It can even be bought ready made portion-wise in the supermarket. This dessert is best served with cold milk poured on top of the pink semolina foam. Heat the water in a pot, add the cranberries and cook until the cranberries start to pop open. Use a lid to avoid spillage on your apron. Cook for about 10 minutes. When the berries are soft use a wooden spoon to press them against the side of the pot to get out as much juice as possible. Pour the juice through a sieve and again press the berries against the sieve. I put the skins back in the pot and bring to boil with a little water to rinse them through once more. Sieve the second juice as well. Discard the empty and dry skins and return all the juice into the pot. Add the sugar, let it melt. Taste. If not sweet enough add more sugar. Slowly spoon the semolina into the juice stirring all the time. Bring to boil, then turn down the heat. Cook till the semolina has thickened the juice. It should be medium thick (slightly thicker than liquid honey). Take off the heat and let it cool to luke warm. If you are in a hurry cooling the pot on the balcony or in a cold water bath will help speed things up. Leave to cool (in the fridge) overnight or at least till completely cold. When it is not cold it tastes more sour. Serving it with cold milk is the traditional way, but could be eaten without milk should you be allergic to it.